In Romans 5:8, Jesus explains that our ultimate problem as humans is an internal one. It isn’t our culture, our government, other people, or anything external. The condition of our hearts – our character – should be our primary focus. Jesus is the answer to our ultimate problem. When we have relationship with Him, He transforms our hearts and our character. Through Him, we become people whose lives and stories can only be attributed to His power and grace. Far more than a great teacher or loving man, Jesus was fully God and fully man, God’s one and only son. His perfect, sinless life allowed Him to sacrifice Himself for the sins of all people through His death on the cross. He willingly died on our behalf out of His great love for us. He knows each of us by name, knows our weaknesses and the mistakes we’ve made – big and small – and yet He still loves us more than anything. This gift given to us through His sacrifice is free – there’s no amount of good work we can ever do to earn it for ourselves or repay Him for it. When we accept this gift and give our lives to Jesus, acknowledging Him as both our Savior and Lord, we are forgiven and find new life through relationship with Him. Through Prayer: We pray, a conversation with Jesus where we express our love for Him, confess our sins, thank Him for what is happening in our life, and ask for His help in any area of our life – no matter how big or small. This can happen in silence by ourselves, in a group, or through music. Through God’s Word: We study the Bible, God’s Word to us. It is the final authority in all matters of faith and provides direction in how to live our lives. We do this privately on our own, and corporately at Sunday services and small group Bible studies. Through Meaningful Community: We enter into community, seeking friends to support us as we grow and learn to live, love, and lead like Jesus. If you’d like to speak with someone about beginning a relationship with Jesus Christ, we’d love to come alongside you in support! We’d also be happy to supply you with a Bible if you need it! Start here! You’ll find all the answers to your questions at the Start Here corner in the atrium, right under the big banner. 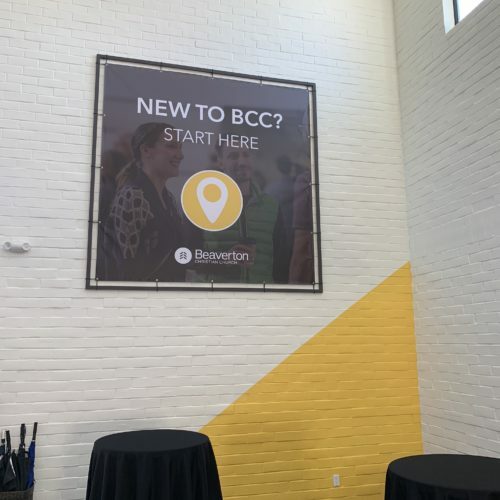 It’s a great place to learn the different ways to find community at BCC, as well as get signed up for the next Discover BCC class!